Nine Years Old: Happy Birthday Silver! He just had his birthday a week ago. I see him less now that he’s older: oldsters appear to become a little bit more guarded about their physical selves than when they were younger. I actually had to go look for him to find him — I wanted to post what a nine-year old coyote male looked like. He’s past his prime and very wise. He knows the ins-and-outs of being an urban coyote: he avoids people and dogs as much as possible, and I know I’ve helped by advising everyone to leash and walk away whenever they see him (or any other coyotes). I first met this guy, sort of, before he was born, by knowing his mom, by seeing her swell in size and then slim down after his and his brother’s birth. I have the exact date. However, I didn’t meet him physically until he was 4 or 5 months old. This is one of several coyotes I’ve known since birth — and for him it’s been 9 years now! His entire personality has matured over time, as is true of most of the older coyotes I know. They are stellar and stable neighbors! I watched his puppyhood, and then how his camaraderie with his brother — they were the best of friends — changed into intense sibling rivalry as they vied for a mate. He had his first litter when he was four years old. His mate disappeared after that so he paired up again, and has been having small litters (one pup each) for the last 3 years. He’s a dad again this year, but I won’t know anything about his pups for 4-5 months. He’s a protective mate and a protective dad. It’s important to abide by his wishes and keep away. Today, I saw him before dawn as he was headed in for the daylight hours — into his daytime resting spot — but he decided to take a short roundabout trek before doing so, the way he always has. He knows me well and allows my presence. He sniffed along the pathway as he walked, assessing *who* (in terms of dogs) had been on the path he was on, and he looked around. I’m sure he knows all of the regular dogs in the park, and their behaviors. He stopped when he reached one of his favorite lookouts, and there he looked around his entire domain. He was on top of the world and he could see everything. This coyote and his family have *owned* the land since I first met his parents 10 years ago. No other coyotes have been allowed into this territory. There have been several intruders over the years, but they were immediately and unconditionally driven out. His dense and long fur — still thick from the winter — conceals the tell-tale scars of age on his face and body which can be seen in June and July when the fur has all been shed. At his lookout, he immediately went into alert-mode, I could tell, indicating that there were dogs, even though in the distance, which he did not feel comfortable seeing. He has been chased often by dogs, and sometimes he has stood up for himself. Here, he stood up, and warily and tensely watched some dog/human duos, but when they passed he lay down, and there was a period of relaxation. He must have been tired: he lay his head down, but I’m sure he kept his eyes on things — I couldn’t really tell because I was in back of him. After this period of surveying his territory, for about half an hour, he decided it was time to head in before more people and dogs appeared in the park. So he got up, stretched, and then sauntered along the same path but in the opposite direction, with me some distance behind. He suddenly stopped: dead still. Two dogs saw him and ran in his direction. They were excited, alert and ready. The coyote’s mood changed quickly from a relaxed, elongated walk, to a compact run, with ears turned back so as to be able to hear everything. He retraced his steps back to his lookout, but to a higher altitude than before: he was anxious. I asked the owner to please call his dogs, which the owner did. Silver remained standing and watching until the dogs were well out of sight, and then he again retraced his steps “home” again, but this time off the path and along a fenceline. He was still worked up: he ate some grass and then heaved, with his stomach pumping in-and-out forcefully, until he was able to regurgitate the contents of his anxious/acid tummy. His pace was now slow again, keeping to the fenceline until he was forced to take the path because of where he was going. He looked around as he now followed the path, stopping repeatedly as he did so. When a runner turned on a path ahead he again became alert; he stopped and waited. He was not seen. When all was clear, he went a little further on the path and then veered off into the tall grasses and then the bushes. So, this was an hour in the life of a nine-year old male, father, mate and territory claimant. Coyotes in captivity can live as long as 14 to 16 years, but in the wild their lives have been estimated to be closer to five years. We’re still learning what their lifespan is in urban settings. Nine-years shows that he’s just as viable, if not more careful, as ever! This older man, King of his territorial domain, no longer hangs out in the open where folks and dogs can see him, the way he often did when he was younger. He’s King because he’s the alpha leader of his family group: either the female or the male breeding pair can be dominant over the others, and in this case it is him. Coyotes hang together in families, not as unrelated members of a “pack” — which is what feral domestic dogs do — and the coyote families “own” their territories from which other coyotes are excluded. This fella is wiser than ever due to his age and experience, and he now prefers safety to beating his chest. He has been through his fair share of injuries — these are unavoidable in the wild, even in the “urban” wild — and they’ve taken a toll in his response times, both physical and judgmental. Injuries are constant in everyday life: they come from fights with raccoons, during hunting when bites and twists and scratches are endured, from human-made items in the environment, including debris that can cause lacerations and cars. In addition they are subject to a number of diseases and parasites, both internal and external which are ever-present in a coyote’s life. He’s almost 7 years old, which is pretty old for a wild coyote, though I’ve known some who were older. As coyotes get older they fit into their urban setting better. They’ve had time to learn the ropes and learn what is a true threat. So, although this fellow still sometimes comes out from hiding in the bushes to defend other members of his family who are harassed by dogs, and although he still may, rarely, follow a dog he feels is a potential danger to his family to make sure the dog leaves his critical areas, for the most part, the only time I see him is when he’s navigating from one of his hideout locations to another, or hurrying along as he carries food at twilight to his family. 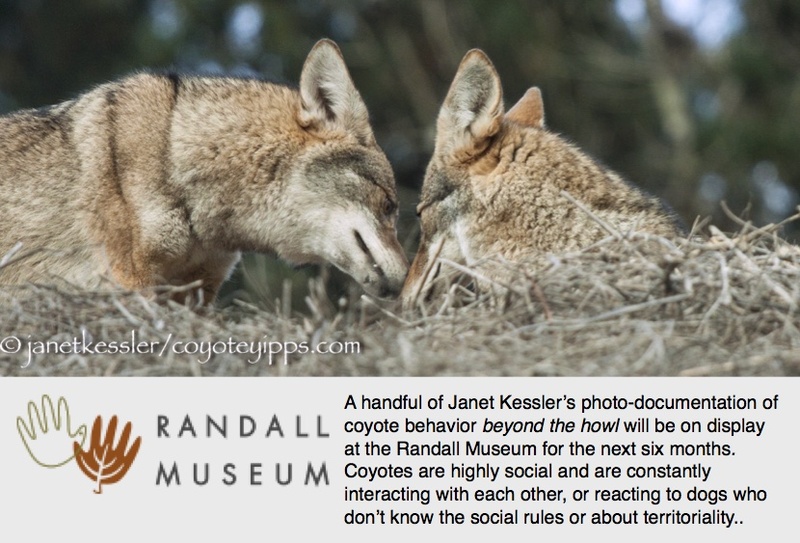 This progression in behavior as a coyote gets older is a normal development. However, it’s not the way all coyotes progress. Each coyote is an individual — same as we humans — and there’s no predicting what path they may take as they age. I watched one female alpha leader actually become more assertive and visible as she aged through her 9 years. Maintaining a visible presence and standing up for her territorial claim was her way of letting others know — coyotes and dogs — that she was Queen of her territorial domain. Regarding visibility of youngsters, I’ve seen mellow youngsters hang out in a field only as long as there was not a lot of human and dog activity in the park — when that activity picked up, they fled into the bushes. And I’ve seen others ready to take on any comer (any dog) who ventured too close to where the family was hanging out, becoming “front men” (the “linebacker” so to speak) and putting themselves at risk for the safety of their family. He walks along a line of bushes so as not to draw attention to himself. He slips — quickly and surreptitiously — into the bushes and out of sight. We all age. We are aware of this passing of time in our grandparents and even in ourselves, and also in our pets. Joints get stiff, energy diminishes, vision and hearing become impaired, past injuries make themselves known again, there is a slower recovery period. We slow down physically, and sometimes mentally. It happens to all life. I would wager that few of us are aware of the aging process in the wildlife that surrounds us. Time and life in general take their toll on them, too. The reason I’m bringing this up is because I’ve been watching an older coyote who squints more and more lately — it’s a regular behavior now — when she is looking out into the distance. An aging coyote can lose clarity of vision, can develop cataracts and glaucoma, just like other dogs and like humans. The squinting has been going on for several months, and I have not noticed anything particularly wrong with the eyes, such as discharge or inflammation, so I have to assume it’s simply due to more difficulty with seeing. A friend gave this explanation about squinting: Squinting allows you to focus better. Its not so much about changing the shape of the lens in the eye which fine tunes focus, it’s more about changing the light entering the eye — a bit like narrowing the aperture of the camera. Squinting gets rid of light “noise” allowing a slight improvement of focus. Coyotes may squint for other reasons. For instance, coyotes may squint at another coyote or dog they don’t like who they see wandering in the distance — it indicates dislike. If the object of dislike is close enough, squinting becomes a warning device — a communication — which can be read and should be heeded by the other animal. However, the squinting I’ve been observing in this older coyote is not about dislike nor is it a warning because it only occurs when there is no other critter around. Although I’ve read that dogs squint when they are having vision problems, including glaucoma and cataracts, I’m not sure I’ve ever seen it. It seems to me that dogs are usually more absorbed in their immediate surroundings — they have little, if any, need to be looking for something specific in the far distance. Coyotes, on the other hand, are always surveying their domains. They search for what is going on: they need to see as far and wide as possible. If they are older and squinting as they scan the horizon from a hilltop, might it be because of aging eyes?